Card Text Play: For the remainder of the turn, each time you play another card, draw a card. I have chosen house Logos to be my active house this turn and start off by playing Library Access. I then play Wild Wormhole. In what order do I resolve this combination of effects? You gain 1 Æmber from Wild Wormhole’s Æmber bonus. You draw a card from Library Access’s effect. You resolve Wild Wormhole’s effect and play the top card of your deck. You gain Æmber from any Æmber bonus on the played card. 5. You draw a card from Library Access’s effect. You resolve any play effects on the card played from the top of your deck. When exactly do I draw cards from Library Access’ effect? 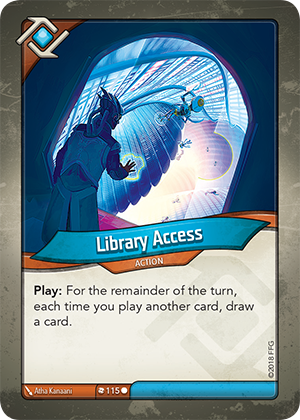 For each played card, you draw a card from Library Access’ effect after gaining the Æmber bonus for that card, but before triggering any “Play:” abilities on that card.